Back pain can afflict anyone and when seeking treatment to alleviate the pain, many people are now turning to medical cannabis. Estimates show the prevalence of common (non-specific) back pain is around 60 to 70 percent in industrial countries each year. Back pain can bring on symptoms like significant pain and muscle spasms — even nausea from the medications to help ease it. Fortunately, medical marijuana for back pain can help. How Is Medical Marijuana an Effective Treatment for Back Pain? One alternative treatment for back pain is medical cannabis. Medical weed is increasingly becoming a preferred treatment for patients with chronic back pain. Although conventional treatments can be effective in treating the symptoms of back pain, they can also come with side effects like nausea, stomach upset, ulcers and gastric bleeding. A University of Colorado’s Spine Center research project looked at 200 patients who had back pain or degenerative disc problems. Out of all the participants who used cannabis for back pain, 89 percent said it eased their pain moderately or greatly. Eighty-one percent claimed it worked as well as or even better than narcotic pain medication. They also stated that they didn’t need to consume weed more than one or twice a day. With more states now allowing medical marijuana, researchers can begin to see more data about cannabis and its ability to treat pain. In a study, participants reported a 45 percent reduction in the intensity of their pain within 20 minutes of inhaling the treatment. Cannabis is particularly helpful for muscle spasm of the back. In many states, muscle spasms are an approved condition for the use of medical marijuana. North Dakota has approved chronic back pain as a qualifying condition for medical marijuana use. There is great value in marijuana’s anti-emetic properties. Doctors typically prescribe pain patients with opioids or other narcotic drugs. The main side effects of these types of medications are nausea and vomiting. Because cannabis treats both nausea and pain, many people attest to its widespread healing powers. And, this doesn’t even include its strong mood enhancing properties that help with depression and suicidal thoughts. Because of these effects, many states have included nausea as a qualifying condition for marijuana. Most back pain cases are due to inflammation causing degenerative disc disease. As you might already know, medical weed is an outstanding natural medicine for addressing inflammation and chronic pain. Therefore, it’s no surprise that patients suffering from back pain due to degenerative disc disease find relief with this treatment as well. To obtain medical cannabis for back pain, you first need to consult with a licensed cannabis doctor. They’ll go over your symptoms, give you a diagnosis and then recommend medical weed for you. You’ll have to go get a medical cannabis card and then shop around your local dispensaries to find the cannabis products and strains you desire. Inhalation (vaporizing or smoking): When you inhale medical weed you’ll find immediate relief, usually after only a minute or two. Raw juice: Juicing your medical pot works like a dietary supplement where you drink it a few times a day. It relieves your pain without the psychoactive effect because it’s not heated. Tinctures: You swallow tinctures or place them under your tongue. When you take them under your tongue, you’ll get quick results, although not as quickly as you will with smoking. Edibles: You get a slower effect with edibles since they are essentially food and will have to make it through your digestive tract so your liver can metabolize the weed. However, you’ll get longer lasting relief and typically a better psychotropic effect. Oils: Marijuana oils offer you a completely different experience. You use oils in small doses and then scale them up. Oils deliver your body high concentrated amounts of cannabinoids. Each marijuana strain works differently for each person. However, heavy THC strains seem to work best at relieving pain while CBD strains are better at decreasing inflammation. When you decrease inflammation, it decreases your back pain. It’s also essential to understand that strains with a higher percentage of THC also have more psychoactive effects. So, during the day, you may wish to use a strain that’s lower in THC and save it for the evening before you go to bed. Bubba Kush (indica): Bubba Kush contains up to 22 percent THC and up to 0.1 percent CBD. It’s good for lowering your stress and easing muscle tension. Candyland (sativa): With around 24 percent of THC and one percent of CBD and CBN, Candyland is a great strain to reduce pain and relieve your muscle tension. It also has stimulating effects, so it’s good for fatigue. Headband (hybrid): Contains up to 27 percent THC, but lower CBD content of less than one percent. Headband eases pain and relaxes muscle strains. It lasts longer than other strains too. OG Kush (indica): Contains up to 23 percent THC and around one percent CBD. Works well for muscle spasms and relieving pain. ACDC (sativa): ACDC is high in CBD but low in THC. It contains up to 24 percent CBD and around 1.2 percent THC, making it great for reducing your pain without the psychoactive effects. Red eyes: Most if not all people who use cannabis will experience redness in their eyes. This is not harmful and you can alleviate red eyes with eye drops. Short-term memory loss: After using cannabis, some people experience short-term memory loss. Again, this is a temporary side effect that goes away once your treatment wears off. Heightened sensory perception: This is a side effect that enhances your sight, hearing, sense of taste and sense of smell. Fatigue: Fatigue is common with THC-rich strains. To avoid this side effect, you may want to use a sativa strain which uplifts you and gives you energy. The University of Colorado Spine Center released a study which found marijuana alleviated back pain in a manner safer than opioids. In fact, 90 percent of individuals who used the herb reported a substantial reduction in their back pain and 80 percent considered medical pot to be an equal, if not better, treatment than opioids. So, we’ve now gone over how medical marijuana and back pain treatment can significantly help with your pain and other symptoms. Let’s now go over what back pain is, its symptoms, causes and other information. Back pain is a problem that many people are all-too-familiar with. It can range from a constant, dull ache to a sharp, sudden pain that incapacitates you. A fall, an accident or improperly lifting heavy objects can bring on back pain suddenly, or you can develop it gradually as your spine changes with your age. No matter how your back pain came about, you know how it feels and how it can affect daily living. Back pain is among the common reasons people seek medical care or self-treat. When considering your treatment options for your back pain, it can be helpful to learn what the major types are. Mechanical pain, also called axial pain, is the most common cause of pain in your lower back. The pain is mainly from your ligaments, muscles, bones in your spine and surrounding it and joints (sacroiliac joints, facet joints). Mechanical pain is often localized to your buttocks, lower back or the top of your legs. Radicular pain occurs when your spinal nerve root becomes inflamed or impinged. The pain might include pain radiating down into your leg or buttock, or it may follow a particular nerve root pattern. You’ll experience a distinct sensation that’s an electric, sharp and burning type of pain, sometimes accompanied by weakness or numbness. Chances are you’ll feel it on only one side of your body. Your body has nociceptors, also known as sensors, that spot stimuli that are potentially harmful. The receptors alert you when you have an injury to your tendons, ligaments, muscles, joints, skin, bones or other organs. Your central nervous system and brain receive pain signals that result in you feeling pain. As your injury heals, the nociceptive pain eases. Neuropathy, also known as neuropathic pain, is pain caused by injury or damage to your nerve tissue. Nerve damage can occur from an injury or infection elsewhere in your body. Once you have damage, your nerves continue sending pain signals even after the injury heals. Back-related neuropathic pain causes the symptom known as sciatica. Sciatica occurs when the nerve root in your lower back is pressed upon or compressed, triggering numbness and pain along your sciatic nerve that stretches from your feet to your buttocks. You may also have pain that travels down your arm from your spine and persisting pain following back surgery. Both nociceptive and neuropathic pain can be broken down even further into acute and chronic pain. Both differ significantly in function and form. Acute pain falls under the umbrella of nociceptive pain. With acute pain, the level of your tissue damage level determines your pain severity. Acute pain is a sign of diseased or injured tissue. Your body has a type of protective reflex for avoiding pain like this. Once healed, your pain dissipates. Chronic pain doesn’t have a protective reflex or any other biological function that’s helpful. Instead, your nerves continue sending pain signals even after the initial tissue damage heals. Chronic pain falls under the umbrella of neuropathy pain. Sudden back pain that is acute or doesn’t last any longer than six weeks could be caused by things like heavy lifting or a fall. If it lasts longer than three months, it’s considered chronic. Ligament or muscle strain: A sudden awkward movement or repeated heaving lifting can strain your spinal ligaments or back muscles. If you’re not in good physical condition, continuous strain on your back could lead to painful muscle spasms. Ruptured or bulging disks: Your disks work like cushions between the bones in your spine. You have soft material inside your disk that may rupture or bulge, pressing on a nerve. But, you can also have a ruptured or bulging disk with no back pain. Arthritis: Osteoarthritis can impact your lower back. Sometimes spinal arthritis may cause narrowing of the space that surrounds your spinal cord. This is known as spinal stenosis. Skeletal irregularities: Irregularities can come from a condition known as scoliosis where your spine curves. It can cause back pain, but typically it doesn’t cause pain until middle age. Other skeletal irregularities can also cause back pain. Osteoporosis: The vertebrae of your spine may develop compression fractures if you have brittle and porous bones. Statistics on back pain reveal how common the condition is and its impact on individuals and society as a whole. At any given time, around 31 million people in the U.S. are suffering from lower back pain. Each year, half of all working Americans say they’re experiencing back pain symptoms. Around 80 percent of the population at some point in their lives will experience back pain, according to experts. 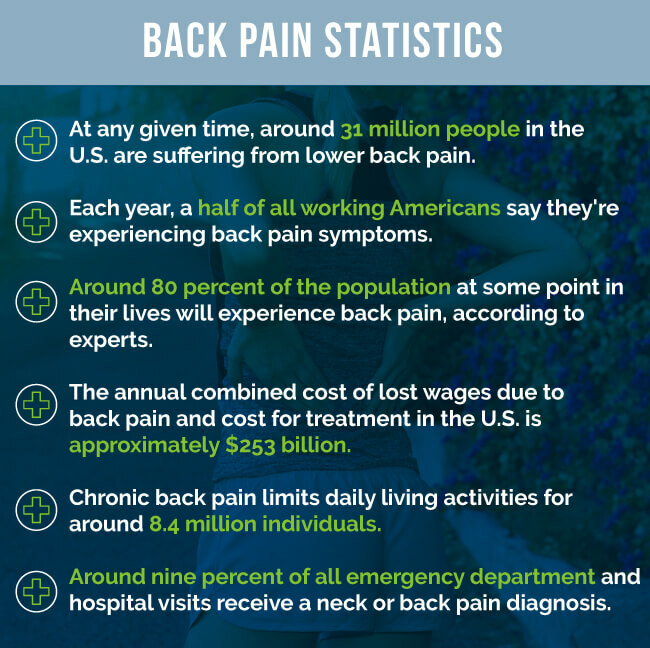 The annual combined cost of lost wages due to back pain and cost for treatment in the U.S. is approximately $253 billion. Chronic back pain limits daily living activities for around 8.4 million individuals. Around nine percent of all emergency department and hospital visits receive a neck or back pain diagnosis. Researchers classified back pain as a rheumatic disorder. It was during this time that doctors began considering and treating back pain and sciatica together. The new therapeutic rest orthopedic principle increasingly dominated their management of this type of back pain. In the late nineteenth century, backache began to be considered a chronic disability. This only escalated following World War II. Back pain produces a range of symptoms. The pain can be mild and only slightly annoying, or it can be so severe as to be debilitating. Your onset of back pain can appear suddenly, or begin slowly and get worse over time gradually — sometimes coming and going. The effects of your back pain effects can be both physical and mental. Achy or dull pain localized to your low back. Burning or stinging pain that may or may not include sciatica that moves from your lower back to the back of your thighs, even into your feet. Tightness and muscle spasms in your hips, lower back and pelvis. Worsened pain after prolonged standing or sitting. Trouble walking, standing up straight or going from a standing position to a sitting position. When your back pain becomes chronic, it may also impact your mood and emotions. You might blame everything on your backache, claiming that everything would be better if you didn’t have pain in your back. Chronic pain can interfere with your daily life and activities. It can make it difficult to remember things or concentrate. It can affect your sleep or your appetite. When you’re in constant pain, you may worry you won’t be able to perform your daily routine or go to work. All this builds stress, making it understandable why some people get irritable, depressed and anxious. People with chronic back pain also often struggle with depression. Those with chronic pain are much more likely to be diagnosed with clinical depression or major depression. Depression like this is much more than feeling “blue” or normal sadness and is a common psychological effect of constant back pain. If conservative treatments don’t work, and your pain persists, back surgery could be an option. There are several different types of back surgery. Laminectomy: Laminectomy involves your surgeon removing the bone that overlies your spinal canal. This procedure expands your spinal canal and relieves spinal stenosis-related nerve pressure. Discectomy: The surgeon removes the herniated portion of the disc that’s irritating your nerve and causing inflammation. They’ll either remove part or all of the back part of your vertebra to get to the ruptured disc. Artificial discs: The implantation of artificial discs is a spinal fusion alternative treatment for painful movement between your two vertebrae caused by an injured or degenerated disc. Most people, however, can’t receive this newer treatment option. Spinal fusion: The surgeon uses this treatment to connect two or more of your spine bones permanently. It helps ease your pain by providing a spinal fracture with stability. It sometimes helps ease painful motion between your vertebrae caused by an injured or degenerated disc. Before agreeing to back surgery, you may want to consult with a qualified spine specialist for a second opinion. Spine surgeons may have differing opinions about the type of surgery you need, when you need the operation and whether your spinal condition even requires a surgical procedure. When experiencing pain in your back and legs, it may take more than one health professional to properly diagnose and treat you. Many people with back pain seek out a chiropractor for treatment. Chiropractors perform chiropractic adjustment by using a small instrument or their hands to apply a sudden, controlled force to your spinal joint. Also referred to as spinal manipulation, the goal of a chiropractic adjustment is to improve your body’s physical function by correcting structural alignment. Cauda equina syndrome, or compression of your nerves in your lower spinal column. Worsening of a disc herniation if you already have one, or a new herniated disc. Vertebral artery dissection, a certain type of stroke, after neck manipulation. Before your chiropractic adjustment, there are no special preparations needed. When an experienced healthcare provider performs the injection using fluoroscopic guidance, it minimizes the risk of any serious complications. Many patients tolerate this treatment well. If you’re suffering from debilitating back pain and would like to know more about medical cannabis and back pain, search for a dispensary or book an appointment with a qualified physician through MarijuanaDoctors.com and our find a doctor search today. Let us help improve your quality of life!